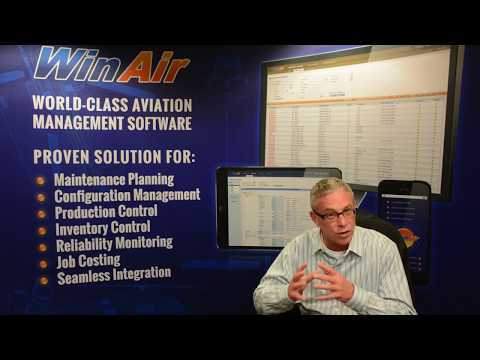 WinAir is a structurally-integrated aviation maintenance and inventory management solution which offers a range of tools for managing production, purchasing, maintenance scheduling, cost accounting, invoicing, and more. Additional modules are available, covering labor management and barcoding, enabling expansion of the system to meet business needs. WinAir offers several solution packages with features tailored to different business types, including operators, airlines, and charters, helicopter operators (Heliops), maintenance, repair, and overhaul (MRO) service providers, and continuing airworthiness maintenance organizations (CAMOs). Custom packages can also be created to suit the specific needs of individual organizations, allowing users to select the exact features to match their particular procedural requirements. WinAir stores unlimited historical data for access and reporting needs, and enables the collection, sharing, and retention of accumulated organizational knowledge. Thousands of procedural controls are built into WinAir, designed to assist organizations in improving the efficiency and safety of their inventory and maintenance management processes. Custom-built templates aim to streamline the creation of aircraft maintenance schedules, and integration between maintenance and inventory control structures removes the need for duplicate data entry and ensures data integrity. WinAir also offers department work backlog queues, workflow management, mechanic licensing, vendor and customer management, alerts, internal notes, a compliance manager, and more. I would recommend WinAIr (and actively discuss with prospective purchasers) due to it's ease of use, functionality, ability to grow with the Company and its cost effectiveness.Ease of use (windows point & click) with generally good control of compliance. Ability to add functionality through modules and grow with licences is a big plus (although cost of some of these is a concern). The continious improvement and development of the software ensures the atractiveness of the software to existing users. Ease of use (windows point & click) with generally good control of compliance. Ability to add functionality through modules and grow with licences is a big plus (although cost of some of these is a concern). The continious improvement and development of the software ensures the atractiveness of the software to existing users. Assembly Management and Reporting is a major negative however version 6 is suppose to solve these issues (or at least most of them). We are transitioning towards this version howver the process & work to do so is difficult & time consuming. Local support in the Australasia region is not readily availbale to ring up and discuss issues (possibly implement more accessible phone support to suit our time zone). We currently extract raw data from the SQL tables to create our own extensive reporting functionality which is disturbed every structural change (although version 6 may incorporate some of our needs).
? ?Using this product for more than 5 years, starting with Version 5 up to version 6.1.3 - It's a web version - It's friendly user, the format lay-out is easy to learn and use, and streamlines with the work flow - Data management is pretty much integrated and easy to retrieve. Using this product for more than 5 years, starting with Version 5 up to version 6.1.3 - It's a web version - It's friendly user, the format lay-out is easy to learn and use, and streamlines with the work flow - Data management is pretty much integrated and easy to retrieve. We utilize WinAir Management Software (Inventory, Maintenance, Finance) and find it easy to use. WinAir personnel are always available to listen and to assist with any issues and are always receptive to hearing future development ideas. Using WinAir to manage our maintenance/inspection schedule has enabled us to accurately forecast upcoming events easily, accurately, and efficiently. The online training videos are a huge help when training new users, or as a quick refresher for functions of the maintenance program that are used infrequently. Overall, WinAir has proven to be a critical component in our success in managing our fleet maintenance programs. David Smith Chief Inspector Neptune Aviation Services, Inc. The way the different modules work together. The way the different modules work together. There could be more reports. The reports available are all great, but there could stand to be a few more. Av-Base Systems is definitely moving in the right direction with it's web development. i am very much looking forward to having the inventory management side of the software moved to the web environment.System follows a logical sequence for setting up, installing and tracking aircraft maintenance activities and inventory. As the product administrator and the Maintenance Planner, the upgrade to 6.0 has saved me months of work - literally. The new product is a big departure from the dbase product we were used to and as such there is a large learning curve for us but the process has been very useful finding and cleaning up bad information in our database. The 6.0 product has more checks and balances at critical spots to help keep the database clean. The off wing assembly functionality has great potential to save time and labour. The ability to organize tasks into checks is going to have a huge positive impact on our heavy maintenance environment as we move forward. System follows a logical sequence for setting up, installing and tracking aircraft maintenance activities and inventory. As the product administrator and the Maintenance Planner, the upgrade to 6.0 has saved me months of work - literally. The new product is a big departure from the dbase product we were used to and as such there is a large learning curve for us but the process has been very useful finding and cleaning up bad information in our database. The 6.0 product has more checks and balances at critical spots to help keep the database clean. The off wing assembly functionality has great potential to save time and labour. The ability to organize tasks into checks is going to have a huge positive impact on our heavy maintenance environment as we move forward. Inventory portion of the web product is not yet deployed. Off wing assembly task posting still requires additional rework/functionality to be truly useful. In the free trial we could see that it is a good tool for the maintenance of aircraft, although other options were tried before making a decisionExcellent customer service, punctual to the requested topic and very attentive. Online help is a great help to solve any doubt. Excellent customer service, punctual to the requested topic and very attentive. Online help is a great help to solve any doubt. Contact AV-Base Systems for pricing information. Integration between WinAir’s inventory control and maintenance functionalities ensures data integrity and removes the need for work to be duplicated. An unlimited amount of data can be stored centrally to be viewed at any time, or used to generate a variety of reports. Thousands of procedural controls are built-in with the aim of assisting clients in improving the efficiency and safety of their inventory and maintenance processes. Custom-built templates allow users to rapidly create aircraft maintenance schedules for their fleet maintenance programs. WinAir offers several packages for operators, heliops, maintenance, repair, and overhaul (MRO) facilities, and continuing airworthiness maintenance organizations (CAMOs) with specific feature sets for each business type, and also the option to tailor a custom package to suit specific business needs. Below are some frequently asked questions for WinAir. Q. What type of pricing plans does WinAir offer? Q. Who are the typical users of WinAir? Q. What languages does WinAir support? Q. Does WinAir support mobile devices? Q. Does WinAir offer an API? No, WinAir does not have an API available. Q. What other apps does WinAir integrate with? Q. What level of support does WinAir offer?